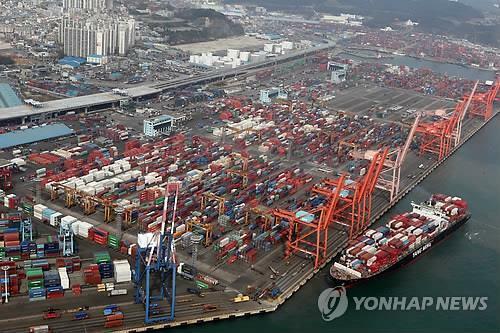 S. Korea's Exports Rise 14 pct in First 10 Days of Sept.
(SEJONG=Yonhap News) South Korea's exports spiked 14 percent on-year during the first 10 days of September due largely to a rise in shipments of chips, petrochemical goods and auto parts, customs data showed Tuesday. The country's outbound shipments reached US$14 billion in the September 1-10 period, according to the data from the Korea Customs Service. The office said that daily average exports, which reflect working days, increased 13.8 percent on-year to $2 billion compared to a year earlier. By product, outbound shipments of semiconductors surged 37.8 percent, with those of autos rising 23.5 percent. Exports of petrochemical goods climbed 41.4 percent. On the other hand, ship exports plunged 30.4 percent, the latest numbers showed. Exports to China, Japan and Taiwan shot up 25.2 percent, 28.3 percent and 87 percent on-year, respectively. In contrast, shipments to the U.S. and Vietnam sank 1.2 percent and 0.3 percent, respectively, the data showed. The country's exports increased 8.7 percent in August compared with a year ago on upbeat sales of semiconductors and petrochemical products. Outbound shipments reached US$51.2 billion last month, a record high for August, according to the data compiled by the Ministry of Trade, Industry and Energy. Imports surged 9.2 percent on-year to $44.3 billion last month for a trade surplus of $6.9 billion, marking 79 straight months in which the country's exports have exceeded imports, the ministry said.